Phoenix, AZ -- SOMOS INDEPENDENTS is a national organization led by Mexican American women who are independent registered voters encouraging voting in our National and local elections. Yesterday, Donald Trump used a dehumanizing term towards immigrants and referred to them as animals. Our organization points the blame directly towards those who call themselves pro-life Christian leaders. For far too long, pro-life leaders have turned a blind eye to Republican lawmakers who use dehumanizing terms towards babies such as "anchor babies", but also with dehumanizing terms used towards fellow mankind. There is a lack of immediate whistle-blowing response by pro-life organizations who turn a blind eye to politicians who use dehumanizing terms towards people -- not just babies. We believe pro life members who are Latino / Hispanic / Chicano should withdraw their support from pro life organizations who do very little to push back on Republican politicians who use dehumanizing terms towards human beings and babies. The National Right To Life organization prides itself on being the largest and oldest pro-life organization in our Nation and continuously ask people to get involved, however, for that organization to grow they must put action behind mere words. The definition of pro life is protecting life from the womb to the tomb. Pro-lifers will steer clear of supporting politicians (like Trump) who use dehumanizing terms towards fellow human beings. We would like for pro-life Mexican Americans / Latinos / Hispanics to be more vigilant as we approach the midterm election cycle to vote against politicians who use dehumanizing terms when referring to fellow man regardless of race or color. According to the PEW, most Hispanics in the United States continue to belong to the Roman Catholic Church. While Catholics claim a significant chunk of Latinos, the Pew reports that the number of Hispanics who identified as Catholic fell 12 percent in just four years, from 67 percent in 2010 to 55 percent in 2014. Many convert to Protestant denominations; many, especially the young, are leaving religion altogether. If any religious denominations and their leaders and/or organizations who have biblical leanings are worried about many leaving religion altogether, perhaps it is time for those leaders to practice the gospel. Perhaps it is time for those leaders to practice what they preach with regard to stories that are told about the Good Samaritan and How To Love Thy Neighbor. Darkness and evil will towards fellow man continue to grow because of the failure of religious and pro-life leaders and we hope to see Latino Leadership arise from the broken pro-life movement as they continue to support politicians like Donald Trump who use dehumanizing and derogatory remarks about fellow mankind. There are 18.5 million veterans living in the United States as of 2016, according to the Census Bureau. Of these, 1.6 million veterans are women. Veterans Day originated as “Armistice Day” on Nov. 11, 1919, the first anniversary of the end of World War I to honor all American veterans – living and/or dead. However, as a Gulf War I veteran who is still alive with an opinion, I have no choice but to believe we are nowhere close to ending wars – instead, I believe we are on the brink of nuclear war. What does my written Veterans Day opinion have to do with one of my favorite rappers of all time? In October Eminem created the ultimate diss of Trump that touched on those who served our military. As I waited and watched the controversy fallout, I saw a lot of reaction from black artists, athletes and even Ellen Degeneres. But what I didn’t see a whole lot of is the reaction from brown artists even though Eminem mentions the immigrant situation and the wall. I was surprised Eminem spit out what many are feeling regarding concerns of being on the brink of nuclear war. Many are in denial about these very real concerns, but the rapper exposes how the government will make every attempt to protect the President whether by plane flying around until the fallout settles, or some kind of other nuclear-proof bunker. Meanwhile, what happens to the approximate 30,000 military members serving in South Korea and the approximate 40,000 serving nearby in Japan? Eminem also confesses Trump may be as stingy as he is, however, Trump is the one who is the elected public servant official who is supposed to do what is in the best interest of Americans. Eminem nails it here. He sees what we see regarding the Russian collusion and investigation of many in his administration and it keeps sinking like they are in quicksand until #45 devises a strategy to divert attention to other matters. I’m thankful Eminem exposes the smoke and mirrors game to his millions of fans. How humiliating it would be for a President to go down in history with spending more time creating bitterness and chaos than taking part in being a solution to humanitarian tragedies. That said, the lyrical lines that addresses “the soldier that is black and comes from Iraq and is still told to go back to Africa” hit a vein with me. The soldiers who are men and women of color have more patriotism in the pinky finger than racist ignorant people who would have known had they served the Armed Forces themselves that the military trains on comradery and the only color that should be noted is the color of our battle dress uniform. In fact the deplorables may want to note that racial and ethnic minority groups made up 40% of Defense Department active-duty military in 2015, up from 25% in 1990, according to the PEW Research Center and 44% of all Americans ages 18 to 44 were racial or ethnic minorities in 2015. In my view, Trump lost complete credibility with me as he tries to seem as if he cares about people who served. He already disrespected us. This above was the best part of the whole diss. Eminem shows he refuses to compromise with racism and I applaud him for that. People of color know the inner racism that has been revealed with this administration and I am glad to see Eminem put his head on the chopping block with angry whites by drawing that line in that sand. Eminem gets it. He understands we must have zero tolerance for the intolerant. He empathizes with people of color and knows we were born that way and we cannot hide it. It feels like we are going backwards from all the progress we have made. It’s unfortunate we have such a divisive President as Commander-In-Chief when our very military leaders try to show on the battle field there is no color – just the color of our battle dress uniforms. Eminem has done more with his concert for valor thanking and boosting military morale than Trump will have done in his entire life. And as such, I want to thank all who have served as we march forward during uncertain times. Kelli Ward has no heart and no class. Kelli Ward is a Tea Party darling with no class and has made herself look like one aggressive Arizona desert vulture. Perhaps it was the Kool-Aid she drank when the largest tea party Facebook Group hosted a Kelli Ward Day a couple of months ago. If she wants to beat Michele Marie Bachmann’s image — she certainly has attained that goal with her recent comments about our decorated war hero and vet Sen. John McCain. Former State Sen. Kelli Ward, who's running against Republican Sen. Jeff Flake in next year's primary, says cancer-stricken Sen. John McCain should resign "as quickly as possible" and Arizona's governor should think about naming her to replace him. "I hope that Senator McCain is going to look long and hard at this, that his family and his advisers are going to look at this, and they're going to advise him to step away as quickly as possible, so that the business of the country and the business of Arizona being represented at the federal level can move forward." Ward, who was defeated by McCain in his Senate primary last year, made the comments the day after doctors revealed the 80-year-old McCain had been diagnosed with an aggressive form of brain cancer. Robert Warrington Reeks of desperation. Sophia Tesch No heart. All hollow. Jim Helga Benbrook She seems to typify the Republican mindset these days. As long as I've got mine, screw you! Jan Buchholz She's all heart, ain't she? Real pro-lifer. She's ready to knock him off -- prematurely no less. Craig Darling I was ambivalent about her before.. Now I am against her completely.. "As a Christian" she says... She's a pretender that should never hold public office again.. She's about power not people apparently. It’s a shame (for gospel reasons) to have Tea Party Christians and the alt right Christians use a tragic illness to advance their agenda. They are quick to judge and are certainly individuals who bring darkness into this world and in my opinion, they are one of the most hypocritical types when their church pulpits claim to spread the message of love and healing. Calling oneself a Christian and rejoicing in Senator John McCain’s illness as a “godly justice” is harming the Christian brand. Christ showed his love through healing and action and we see Arizona hypocrites of the gospel with blood on their teeth. 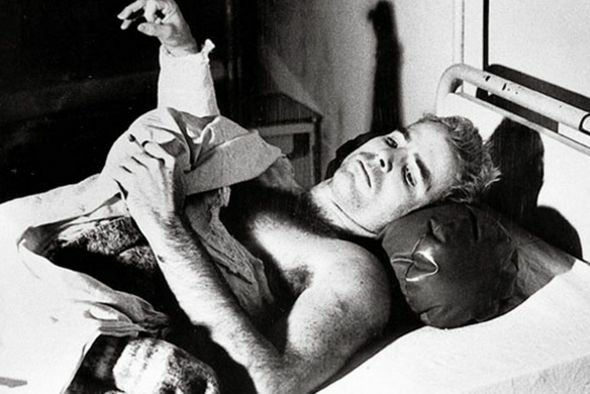 In fact, if Senator John McCain can pull through being a Prisoner of War — he can pull through this! Kelli Ward sounds like someone who is more interested in the position and sounds desperate to do anything to grab power now. This position warrants someone with statesman like character in our State of Arizona. Senator McCain has managed to pull votes in Arizona from Independents and registered Democratic voters, and if Kelli Ward thinks she can fill his shoes, she is sadly mistaken.